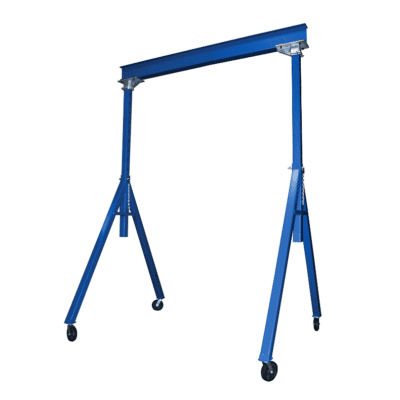 There has been a lot of hype about the harbor freight gantry crane, as it is one of the least expensive options out there. However, some people feel the low cost is a reflection of low quality in the crane. Read on to find out which cranes we think may be better alternatives. A gantry crane is a serious purchase. Not only are they expensive, but they are relied upon to lift seriously heavy objects. It is not worth it to try and save a few bucks on crane of inferior quality. Not only will they cost you more money in the long run by breaking down faster, they will also cause frustration when they are not able to perform the task they were meant to. Lastly, they can be a serious danger if they are not able to properly hold the heavy item you are trying to lift. That is why we put together this list of cranes that are better than the harbor freight version. All of them are well tested, and able to be purchased online. 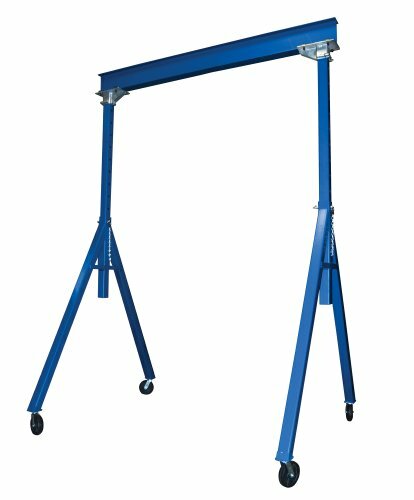 Our top choice for the best product in this review is the Titan Adjustable Telescoping Gantry Crane. This crane has everything that we like to see in a product – Durability, functionality, and affordability. One of the biggest reasons that this crane is an excellent choice is the price. 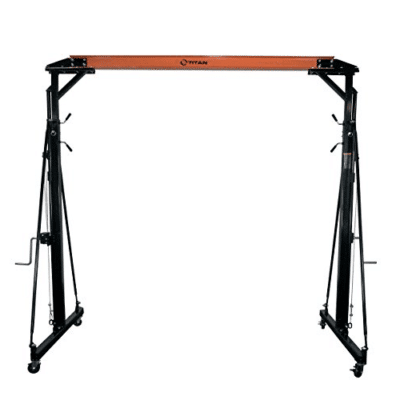 At the time of writing this article, the 1 Ton Pittsburgh gantry crane by Harbor Freight was $729.99, with an additional $100.00 or so for shipping. While the 1 Ton titan model was just $599.99 with FREE shipping. 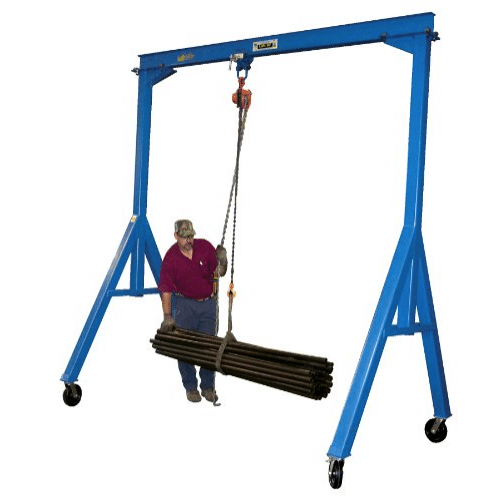 If you wanted to, you could even buy the 2 Ton Titan crane for $739.00, and end up paying less than you would for the Pittsburgh model, but end up with twice the weight capacity. The Titan is loaded with features that make purchasing it worthwhile. It has four locking castors that give you the option of mobility, while still being able to lock in place when you need to. Another nice feature of this crane is the telescoping boom, which allows you to raise and lower the crane height to give more versatility in lifting options. The last bonus to the Titan is the locking pins, which make adjusting the boom height of the crane a breeze. One of the attributes we like to see in a product that we review is durability. It doesn’t make any sense to spend money on a product that is going to need to be replaced shortly. We have a “buy it for life” mentality. The Titan surely fits that bill, as it is made with all steel construction. Using high quality materials is what gives certain Titan models the ability to lift up to two tons. Make sure you check the weight rating of each model, as some are only rated for a half ton. When it comes to price, the Titan is one of the most affordable cranes on the market for its quality. The one downside of the crane is that it does not come with any hoisting gear. Although, at this price, you can purchase the crane, and all the necessary gear, and still spend less than you would on an equally capable crane. 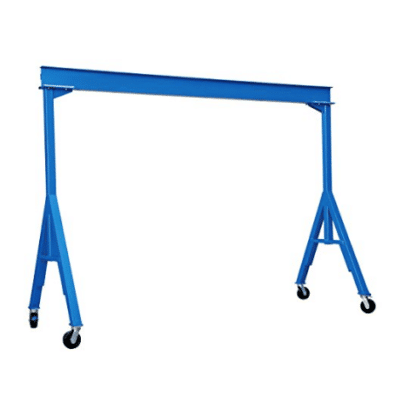 The 2nd best option in our lineup of gantry cranes is the Vestil AHS-2-15-16 Steel Adjustable Height Gantry Crane. Similar to the Titan, this crane is durable and capable, although it is slightly more expensive. The Vestil AHS comes standard with features such as an easy adjustable height system, and four nylon swivel castors with locking mechanisms. It is also made of welded steel construction, ensuring long-lasting durability. This crane is also compliant with ANSI and CMAA specifications, meaning that you don’t have to worry about this crane being unsafe. The steel construction gives this crane a heavy weight, totaling at 790 pounds. It has a maximum height of 192 inches, and a minimum height of 126 inches. The Vestil AHS has a width of 89 inches, and a total length of 177 inches. Large dimensions like this make it easy for the crane to lift up the biggest of objects. Reviewers of this product mentioned that it is of good quality, and was relatively easy to assemble. It also received high marks from all of those who tested the crane. Although it is more expensive than the Titan, it is a top quality crane that should offer a lifetime of high-quality service. For the quality, this is one of the best priced gantry cranes on the market. 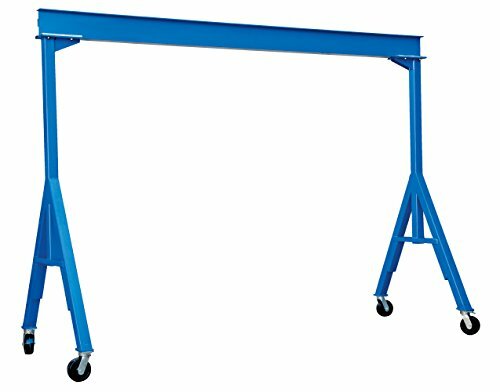 The final item in our review of gantry cranes superior to the Harbor Freight model is the Vestil FHS-4-10 Fixed Height Steel Gantry Crane. In between the price of the previous two cranes, the Vestil FHS is the perfect combination of price-point and quality. The Vestil FHS is very similar to the AHS model, with the exception of a few details. The FHS was designed to be fixed height, as opposed to the variable height of the other model. This offers both advantages and disadvantages. The tradeoff is a higher maximum weight capacity for less flexibility in lifting options. The FHS has double the lifting capacity of the AHS, at two tons. The other major difference between the models is the dimensions of the crane. This model has a fixed height of 128 inches. The length of the FHS is 118 inches, and the width is 64.5 inches. This crane is nearly 200 pounds lighter than the AHS, weighing in at 598 pounds. The Vestil FHS has all the same features as the AHS – the steel construction, locking swivel castors, and blue powder coat paint. When comparing the the two cranes, the AHS might seem like the better model, but the lower price of the FHS makes up for the weaker specs. 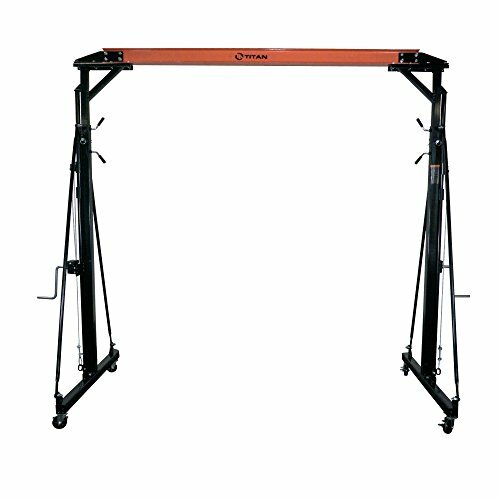 When buying a gantry crane online it’ts really important to think a few things through before making the purchase. First, you need to think about what you will need the crane for – is it for lifting an engine out of a car? moving heavy products around a warehouse? etc. It obviously isn’t for raising an entire vehicle – you need an auto lift for that. Whatever your purpose, make sure that the specs of the gantry crane are able to handle the task you have set for it. Another consideration is that the space you are using the crane in will accommodate it. Check to make sure that the minimum height of the crane is not taller than the ceiling of your work space. A third thing to think about when purchasing a crane, is what other products you will need to buy to complete the job. Most likely you will need a hoist, as well as a trolley. The final consideration is in regard to assembly. These cranes are heavy, and do not come pre-assembled. If you would like to compare the specs of these cranes to the harbor freight one, you can check it out here.